Green Magic Pest Control is a family owned business that was started in 2016. After working for some of the large pest control companies we noticed a gap in a few areas within the industry. Many companies will try gimmicks about what they do in order to acquire new customers then dazzle the customer on the first appointment then would drop service in order to spray as many customers in one day. Green Magic was started with the motto “Every Appointment should be better than the last one”! We have been doing our best for the customer since day one and making sure that we keep every customer happy and pest free. We have many special ways of doing this. A big game changer for our company was to make sure we pay our technicians by the day and not by how many customers they can get through. We schedule every appointment individually as to not rush and since no two houses are alike. This with some other customer first practices make Green Magic Pest thrive in a highly saturated market. 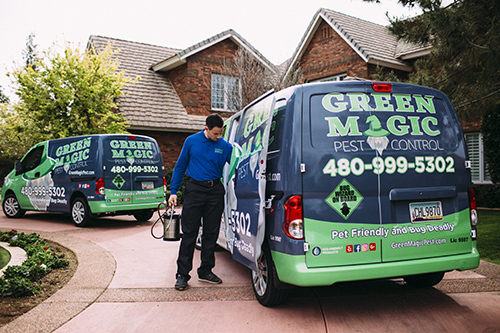 Green Magic Pest is here for the customer providing a top level service at affordable prices. We also differ by not hiding our pricing and giving different levels of cost to different area codes. We are consistent and fair to every single customer we have. Green Magic plans to always be improving so remember that our customer comes first do you will always benefit from any changes we make down the road. Thanks for taking the time to learn a little more about our business. Go ahead and give us a call today and learn how we can provide the best experience with pest control you will have.